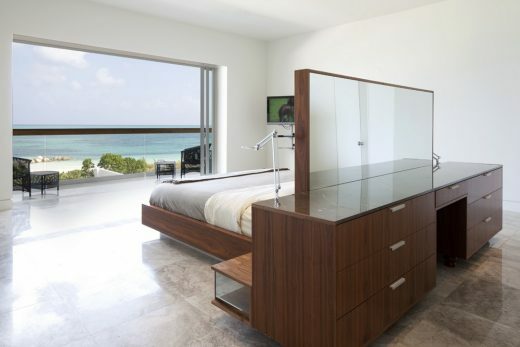 Beach Residence, Bahamas, Atlantic Ocean – design by Prototype Design Lab Inc. The Bella Vita Villa celebrates its natural, oceanfront site. 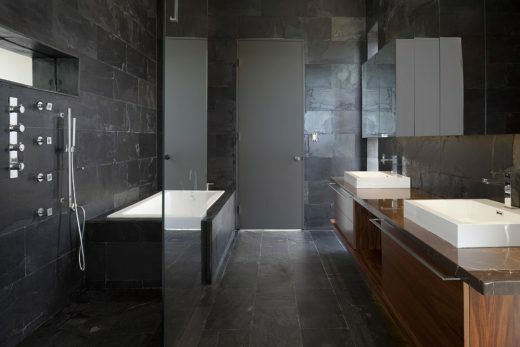 The villa explores lightness, filtering natural breezes, layers of transparency and integrating indoor / outdoor spaces within dynamic patterns of light and shadow, providing a simple frame within which a contemporary sustainable lifestyle can unfold. 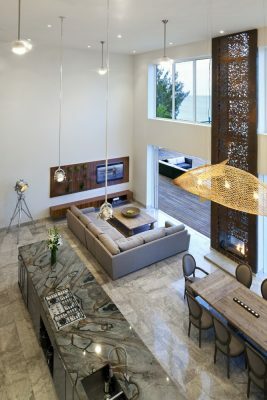 The beachfront facade is almost entirely sliding glass openings to maximize on the view, natural light and fresh breeze of the ocean. 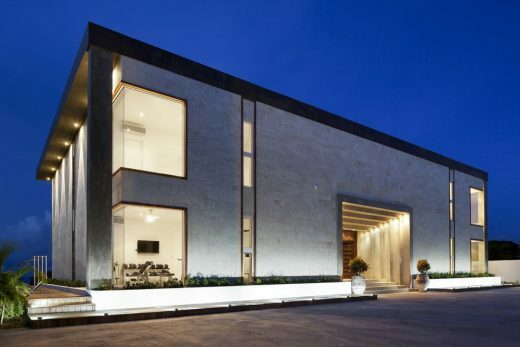 The villa is wrapped on the top and bottom by solid concrete bands which extend along the sides of the house to become the solid entrance facade. 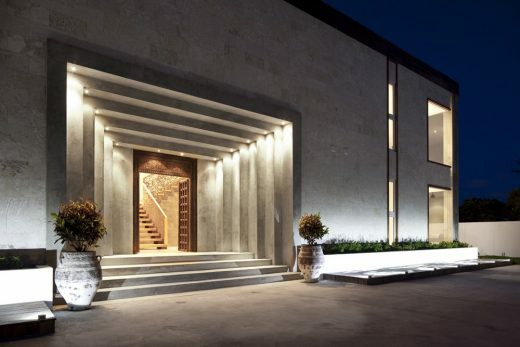 The entrance evokes a fortress-like grandeur, into which a masterfully crafted, poured-in place concrete frame successively recedes toward an door of a more intimate human scale. This drama is counterbalanced by the old-world beauty of an original, hand-carved wood door, reclaimed and imported from India. 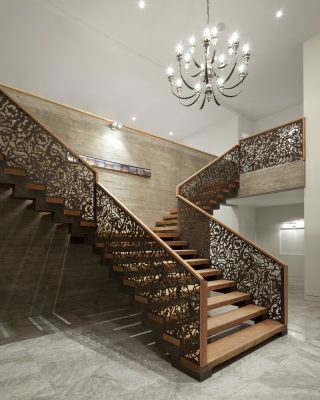 The layering continues in the foyer with a custom lace patterned grand staircase cantilevered off of a board-form concrete wall.The connection between the expansive deck, LED-lit negative-edge pool, and living spaces is dynamic and direct. 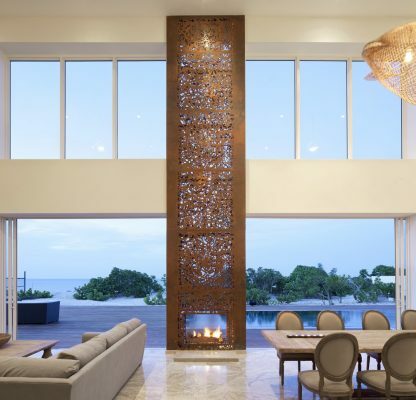 At the heart of the house, an expansive great room is an entertainer’s dream, featuring 30-foot ceilings, a large chef’s kitchen and a two-sided, indoor-outdoor fireplace above which sunlight is filtered through the custom laser-cut chimney pattern. 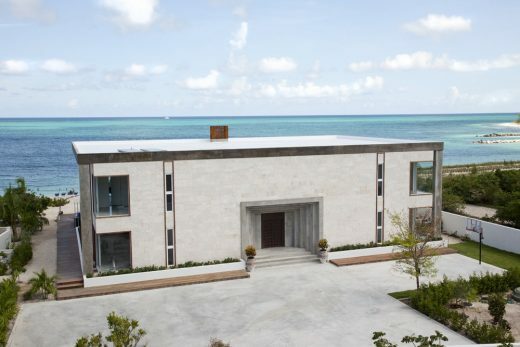 The secluded white beach is a focal point with which almost every room in the villa enjoys a connection. 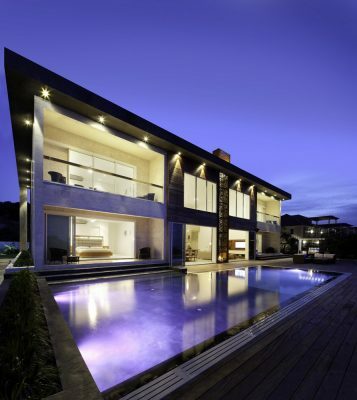 Prototype Design Lab is the recipient of an International Property Award for Bella Vita Villa for Best Residential Design. Bella Vita Villa on The Turks and Caicos Islands images / information from Prototype Design Lab Inc.
Website : Prototype Design Lab Inc.